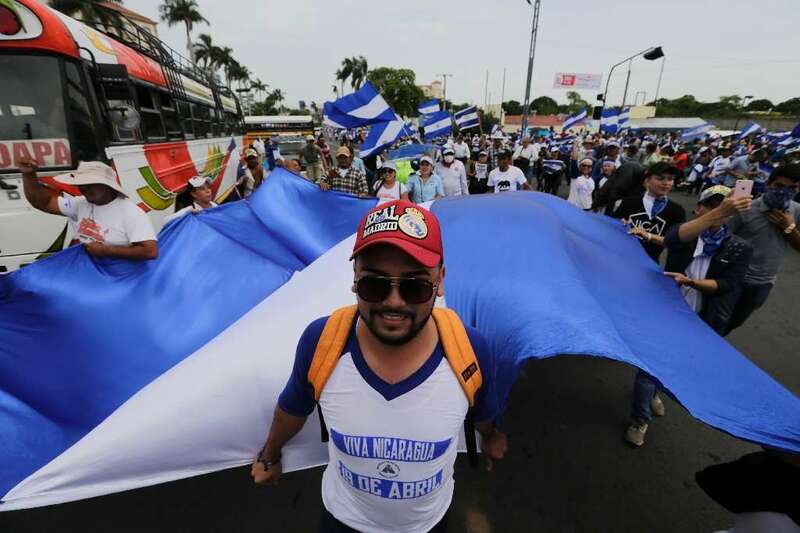 At least six protesters marching against Nicaraguan President Daniel Ortega were shot and wounded Saturday, as thousands to the streets across the country. 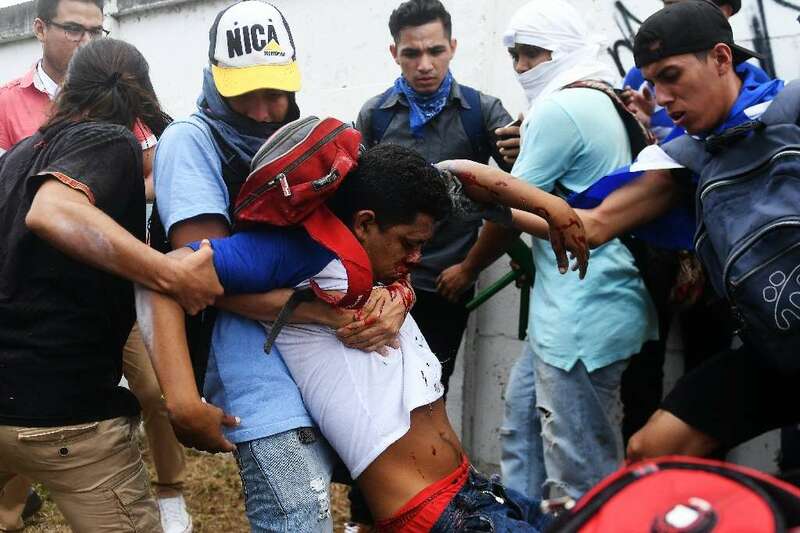 As a march began in Managua, armed men fired on a protesters' barricade at the National Autonomous University of Nicaragua (UNAN). One student was injured, another of his colleagues told AFP. In Leon, a mother watched as her 24-year-old son was riddled with eight bullets at a barricade set up by protesters. Paramedics were tending to the wounded. It was unclear who opened fire on them in Managua as they approached a property belonging to the Cohen Corporation that had been occupied by squatters. More than 220 people have been killed in two and a half months of anti-Ortega protests and repression by government forces. Saturday's event was called the Flowers March in honor of the children killed in the unrest. "I'm here because I want to see my Nicaragua free, it hurts that children like me have died, but we must continue fighting to get this dictator out," a 15-year-old student wearing a ski mask told AFP. In one hand, he was waving a Nicaraguan flag, and in the other, he held a mortar tube. In other cities, such as Leon in the north, and Masaya in the south, marches were also organized by the Civic Alliance for Justice and Democracy. Among the deaths of children that have shocked the country are that of a five-month-old baby, burned in the fire at his home, and a year-old child shot in the head on a Managua street. Family members blamed both deaths on government forces. Sitting in a wheelchair, Luz Marina, 78, said she went to the march to show solidarity with "mothers who have lost their children." "I have children and grandchildren and it hurts me to think that something could happen to them, that's why I'm here," she said. The protesters demand the resignation of Ortega, a 72-year-old former leftist guerrilla who came to power with the popular uprising that defeated the dictator Anastasio Somoza in 1979, and returned to the government in a 2007 vote. They accuse him of establishing -- together with his wife Vice President Rosario Murillo -- nepotism, a dictatorship and brutal repression. "I have always marched, and today more than for our dead, for the children, I grieve for the murders of Ortega and Rosario. I was in 1979 against Somoza and now against the new dictatorship," said Cecila Cruz, 67. The march, supported by the powerful business union -- formerly an ally of Ortega -- had been suspended a week ago due to the violent incursion of riot police and paramilitaries in several areas of the country. The Civic Alliance pushed back the demonstration to take advantage of a visit from experts from the Office of the United Nations High Commissioner for Human Rights and the Inter-American Commission on Human Rights. "The right to demonstrate is a fundamental element of freedom of expression, the right to assembly and democratic participation," IACHR wrote on Twitter. The two UN officials came to the country in the face of worsening repression, and have met with delegates from the government and the Alliance, as well as with victims of the violence. The two local human rights groups that have a registry of victims differ in their tolls: one reports 285 deaths and the other more than 220. "They want to silence us with bullets, we are denouncing the massacre against the Nicaraguan people that this genocidal government has carried out," said Carmen Martinez, a 64-year-old lawyer dressed in white and blue and with red flowers in her hands. With the mediation of the Catholic Church, the government and the Alliance resumed talks on Monday. But they stalled because Ortega, whose third consecutive term ends in January 2022, still refuses to consider a proposal to move up elections from 2021 to March 2019. A US embassy statement meanwhile urged Americans to stay in place until further notice amid the sometimes violent demonstrations.